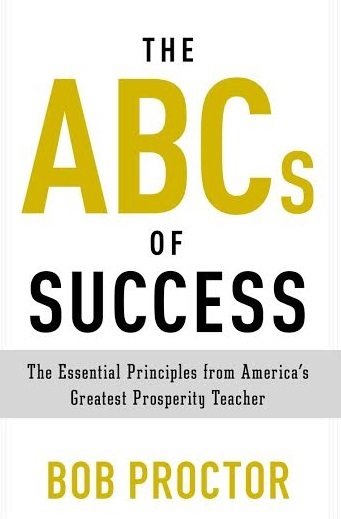 Bob Proctor is the author of THE ABCs OF SUCCESS: The Essential Principles from America’s Greatest Prosperity Teacher (Tarcher/ Penguin; June 9, 2015), the first book from a trade publisher that makes Proctor’s powerful prosperity message available to the general public. A speaker, author, consultant, coach, and mentor, Bob Proctor was already a legendary figure in the world of personal development long before his appearance in the hit film The Secret. For more than 40 years, Proctor has been one of the biggest names in prosperity and personal development, delivering talks throughout the world that help people achieve success and prosperity. Through his work with the Proctor Gallagher Institute, which he co-founded, he has transformed countless lives with his message of prosperity. Visit him online at proctorgallagherinstitute.com and on Twitter @bobproctorLIVE. How did you get into the Personal Development industry? Back in the early 60s, I was given a copy of Napoleon Hill’s classic, Think and Grow Rich. The rest is history. Hill’s book led me to Earl Nightingale’s work. I purchased a condensed version of Think and Grow Rich, a long-playing record that Earl Nightingale condensed and narrated. After that I got into more of Nightingale’s, programs, The Strangest Secret, Lead the Field, etc. I would travel around with a portable record player in my car, playing these long-playing records over and over and over again. I was hooked and made a decision that I would work with Earl Nightingale, which I did. I worked with Earl and his partner, Lloyd Conant at Nightingale Conant for 5 years as their VP of Sales. It was an education that was absolutely priceless. Tell us about the Proctor Gallagher Institute. What inspired the idea and what is your vision for the company? For years, my company had operated under the name of LifeSuccess Productions and I had taken on various business partners during that time span. I’ve never wanted to run the business; my love is teaching the material that had such an impact on my life. Sandy Gallagher came to a program I was conducting in 1996 in Vancouver, Washington. A successful banking and mergers acquisition attorney, she was the complete antithesis of me in terms of background. I had no formal education so to speak; Sandy has degrees coming off the end of her business card. But, what we had in common was our love of study. Sandy invested in my company and opened up the corporate division of LifeSuccess. She had a goal to create a premiere transformational program with me that could be taken into companies and boardrooms alike. I was so impressed with Sandy and what she brought to the table, I asked her to be a partner in the company and ultimately changed the name of the company to reflect our partnership. We are building a global organization dedicated to improving the quality of life worldwide. We create products and services, at a profit, that are in harmony with the Law of Compensation. These products and services are created and marketed with like-minded people who share in our purpose: to live and work in a prosperous environment that encourages productivity, so that we many improve the service we render to our family, our company, our community, our nation, and, ultimately, the world." What strategic partnerships/marketing strategies have you implemented that have attributed to Proctor Gallagher Institute's success? I don’t know that I considered either strategic at the time, but agreeing to appear in The Secret and partnering with Sandy have been two significant turning points for our company. Being in this industry as long as I have, I get a lot of requests to appear in one film or another. If the project aligns with my purpose, I do it, if it doesn’t, I don’t. The Secret was one of those projects that comes along once-in-a-lifetime. It just clicked! I’d received a garbled phone message from someone in Australia. For whatever reason, I didn’t respond to the message, but I wouldn’t delete it from my phone. I asked my assistant, Gina Hayden, to call the woman back and see what the offer was about. She reported back that there was a film crew in the US filming for a new movie but they were going to be travelling back to Australia the week after next. The interesting point here is that they were going to be filming in Aspen, CO the very same weekend my company was running a week-long program there. I walked in, filmed my piece, walked out to door down the street a few blocks to the hotel I was working at and began my program. I had NO idea what this movie would turn out to be but the moment I saw the trailer, I just knew it would take off. Even then, I had no idea the reach it would have or the impact it would have on our business. As for marketing strategies, my son Brian came to me with an idea back in the late 90s. He wanted to create a program whereby he would send out a positive quote each day and then a few times a month, introduce people to programs in the personal development industry that he thought would help people. It was really the start of the “quote a day” business and some 15 years later, it continues to fuel our business. I’ve never been one to follow trends. I don’t pay attention to what others are doing in the industry, I just work at doing a better job at what I’m doing in the industry. I can say that we are paying attention to the millennials. In fact, most of our hires are millennials. They keep me young, they keep me on my toes and I love working with them. People always ask me how I stay so young; I don’t hang around old people. I don’t know as I have a life motto, really. But, I did hear something a while back that I really loved: if you’re not living on the edge, you’re taking up too much space. I have always lived my life in this way. That old adage, better safe than sorry never struck me as sound advice. I bet everything I have on what I’m doing … more often than not it works out. Your greatest success as Founder/CEO of the Proctor Gallagher Institute? Most difficult moment-how did you overcome and what did you learn? I really view winning and losing in the same light; they’re opposite sides of the same coin. It’s the law of polarity at its best. Although winning is great and most people think that’s the big deal, it’s the learning that comes from the difficult times that makes you stronger, that propels you in a new and different direction. I view the difficult times in terms of finding out what I didn’t know. Two things actually. Love what you do and do what you love. And, only take advice from those people who are getting the results that you want. Far too often we ask other people what they think about one thing or another and we allow this person’s opinion to possibly sway our opinion in doing or not doing something. The only two questions we ever need to answer when we embark on something new is: Am I Able and Am I Willing? If you believe that we’re God’s highest creation, then you know you’re able. Then the only question left is - are you willing? Are you willing to do what’s required to get what you want? Only you can answer that. Describe the ideal experience at the Proctor Gallagher Institute. The idea experience at the Proctor Gallagher Institute is that our team is learning every day, earning as much money as they want and doing what they love to do. Money is a reward for service rendered. If you study every day, do what you love and improve the service you render to your clients, the money is a bi-product of that. By example. I try to be the best me that I can and want them to be the best person they can be. Also, I find out what they want and I help them to get it. I’m one of those people who eats to live. I never think about eating. In fact, I often forget to eat. I suppose I like grilled cheese sandwiches and Perrier! I don’t read in bed, but it’s the first thing I do when I get up. I let the dogs out, make a pot of coffee, go into my office, and pull a book from my library. I might spend an hour reading the same paragraph over and over with the viewpoint in mind, how can I use what the author is sharing to improve the quality of my life. That said, if you know anything about me, you know that I’ve been reading Think and Grow Rich for the past 50+ years. I don’t go anywhere without it and I’ve been reading the same copy since the 60s. It’s tattered and falling apart. It’s a part of me. I don’t know as I have any role models, but I’ve had 6 amazing mentors in my time. Ray Stanford, Earl Nightingale, Lloyd Conant, Dr. C. Harry Roder, Val Van de Wall and Bill Gove. I mentioned Earl and Lloyd earlier. Ray Stanford was the individual who gave me Hill’s Think and Grow Rich. He was the first person to really believe in me. Ray saw something in me that I didn’t see in myself. Harry Roder was a student of Concept Therapy and their work, through Dr. Thurman Fleet, changed the course of my life. Val Van de Wall was a distributor for Nightingale Conant when I worked there. I went to hear him speak and we ended up spending 3 days together, he as my teacher and me as his student. He was absolutely brilliant. Though I’d been studying for years, when I heard Val speak, things began to fall into place. And, Bill Gove, he was the Frank Sinatra of the speaking industry back in the day. I love reading biographies and quite often I’ll adopt traits of a particular individual into my own personality. Napoleon Bonaparte wasn’t a particularly great guy, but he had an immense capacity for sustained concentration; he was focused. He was quoted as saying, “I see only the objective, the obstacles must give way.” Anyone who knows me, knows I’m very focused. Studying, reading. I study every day wanting to know more about what makes people tick and why we do what we do. What's next for the Proctor Gallagher Institute? Our goal is to build a school a day in Africa through the Unstoppable Foundation. Now, we’re a long way away from the goal, but it sure does inspire me.